PLEASE NOTE: This PDF is ideal for those who use a dual monitor system. If you plan to print, be aware that the book is 368 pages, and should only be printed using a high-resolution color printer. Printing in black and white will not be very useful! The file itself is about 42 Mb. The download is not immediate; you will receive the download and access information within 24 hours of purchase (during business hours). Authorized by Informatix Software International, this guide will familiarize Piranesi users with all aspects of this highly-acclaimed 3D rendering application. 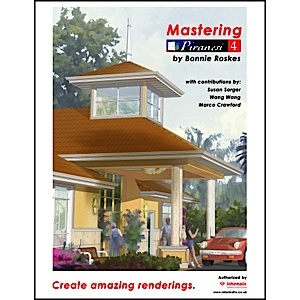 Clearly illustrated, detailed exercises walk you through paintbrushes, textures, cutouts, blending paint, lighting, and non-photorealistic rendering techniques. The book also features contributions from artists on professional techniques and composition.